nancye's art and beautiful junk: Another idea. experiences in my art life. I know others have enjoyed it as well. I've wanted to teach a doll making class but I'm not sure how to go about it. There are a number of options for me and I think I may make a video and sell that as an instruction video. I have taught a few classes in the past but mostly to children. I am a professional doll maker and a licensed designer, but my problem is not what to teach in the class but rather how to produce it. an e-class but I think people would like to see the process rather than read instructions. I know that is true for me. leave a comment on how you would like to learn. I'd LOVE to take an online class from you. I'd just be afraid that it would still be above my comfort level...let me know what you decide to do. 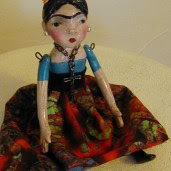 I think your your dolls and your paintings are fantastic. I would love to take an online class from you.